KIEV, December 5. /TASS/. Mikhail Saakashvili, the former Georgian president and ex-governor of Ukraine’s Odessa who now leads the Ukrainian opposition Movement of New Forces, has been detained in Kiev. The special forces took the politician from the roof of his house where he climbed while trying to hide from the law enforcement agents who conducted a raid of his house. On Tuesday morning, officers of the Special Security Service (SBU) Alpha unit broke into the opposition figure’s apartment. Saakashvili’s supporters insisted that the authorities’ actions were illegal and called to allow lawyers to the scene. The law enforcement agents claimed they acted in line with the law. The SBU later issued a statement saying that Saakashvili was charged with "complicity with members of criminal organizations and concealing their activity by providing premises and by other means." If found guilty, Saakashvili faces up to five years in jail. Earlier, his lawyer Pavel Bogomazov told reporters that Saakashvili has been charged with attempting to topple the Ukrainian authorities. At least 200 supporters of Saakashvili continue blocking the streets around his house. Police are trying to push aside the demonstrators. At least one person was hurt in the clashes. 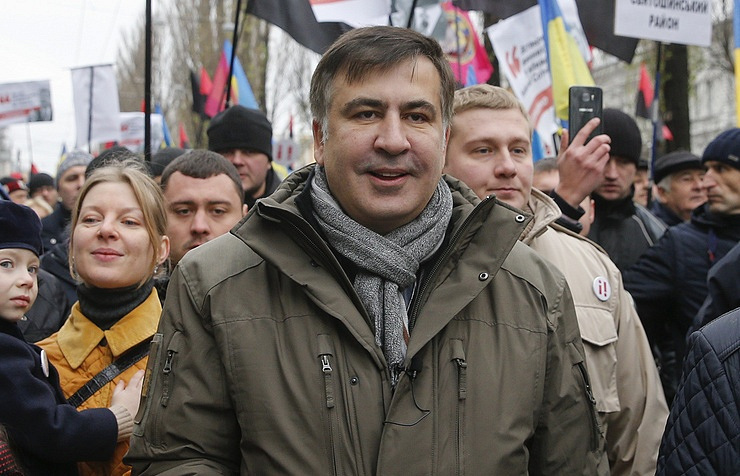 A TASS correspondent reported that Saakashvili has not been sent to a pre-trial detention center. The law enforcement agents took him in handcuffs to the street and placed him in a car. However, Saakashvili’s supporters blocked the road using concrete flowerbeds.